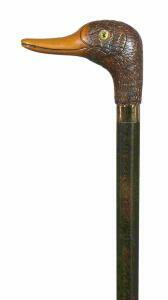 A collector's cane, featuring a duck head mounted on a brown, hardwood shaft. Fitted with a metal ferrule and smart metal collar. The head is made from a tough acetate. This cane is suitable for use as an accessory on formal occasions, but should not be used for heavy support. Overall height 92cm (36"). Ferrule Diameter 19mm.